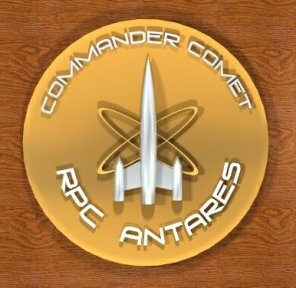 The Antares is a Star Class cruiser of the Rocket Patrol. The Star Class cruisers are the most advanced ships in the Rocket Patrol and in the Solar System. Their powerful engines, deadly weapons, and long range sensors make them very effective against the pirates, criminals and warlords who threaten the peace of the spaceways. Click on thumbnail to see four-view drawing. Specifications: Star class cruiser: built at the Terra Alta orbital dockyard.